It is well known that Vienna is a world-renowned city of music but did you know that you can visit some of the stars of centuries past at home? They all lived in Vienna for a while. Some were born here, others lived and worked here and some died in Vienna. You don’t have to go to the central cemetery – even if the artists’ final resting place is really worth visiting (See the article about the central cemetery here). No, in fact, you can actually visit the original “locations” of musicians and star composers in Vienna and are invited to feel their aura. Only a few steps away from Hotel Stefanie and Hotel City Central in Praterstraße 54, the composer, musician and conductor Johann Strauss II lived for seven years. The exhibition rooms comprise about half of the former apartment and are very lovingly and informatively designed. Don’t be put off by the private looking entrance gate at the building. In fact, the Strauss museum is behind it on the 1st floor next to some private apartments. 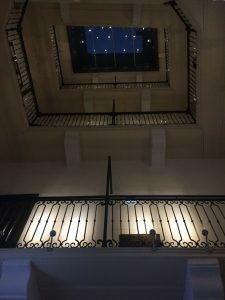 The first floor was the most sought-after and most expensive at that time for the simple reason that back then you didn’t have to go too far without a lift and the living room and/or the salon had to be situated in front of a lively street to offer a good view. Here, in 1867, Strauss completed Austria’s unofficial anthem, the waltz “An der schönen blauen Donau” (“The Blue Danube”). 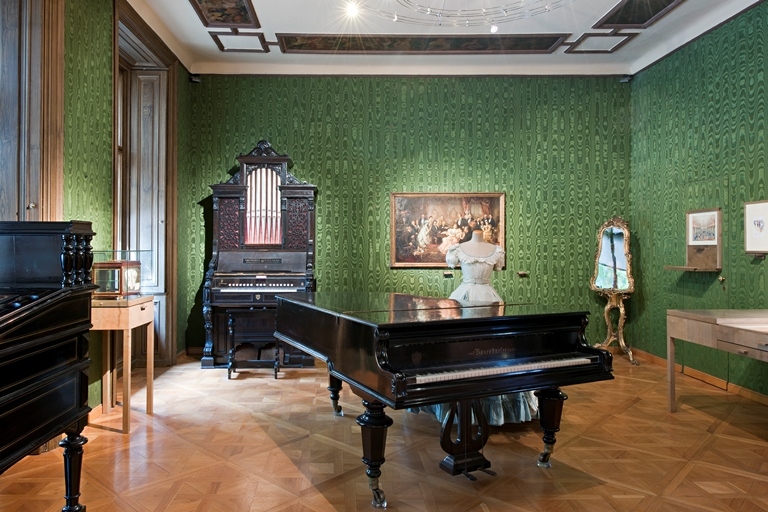 Besides the obligatory pictures and sheet music, you will see original artefacts from the estate of Johann Strauss: Furniture, such as the high desk on which Johann Strauss composed everything, but also musical instruments, such as his piano, the violin and the house organ equipped with a percussion register, which had a quiet but nevertheless good sound so he could work through nights without disturbing fellow residents. Already 100 years earlier, a world-famous composer lived in Domgasse 5, in the 1st district. 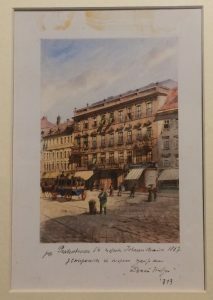 From 1784 to 1787 it was the apartment of Wolfgang Amadeus Mozart. He spent 2 ½ years here, which were among his most successful. 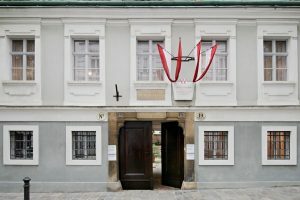 Moreover, it is Mozart’s only existing apartment, because he and his family have moved several times within Vienna and nowhere else have they stayed as long as here. What the apartment – like that of Strauss on the first floor – looked like or how it was divided one can only guess today. This is exactly what makes the tour in Mozart’s house exciting. The wood panelling has been proven to be 300 years old, i.e. original, and the view from the presumptive “lounge” is as it was 300 years ago. The exhibition itself covers all 3 floors of the building and shows Mozart’s entire life including varying special exhibitions. Currently: “Mozart – Path to Immortality”, which deals with the composer becoming a cult figure after his death. A special highlight awaits you in the former wine cellar, the “Bösendorfer Hall”. In July and August 2018, a one-hour piano concert awaits you in the historic dome every TUE and THUR at 4 pm. (€ 25.00/incl. museum € 29.00). The regular evening program for the rest of the year can be found here. 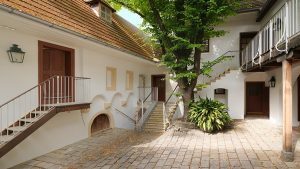 Beethoven used the Eroica House in Döbling during the summer months, where he is said to have worked on his Symphony No. 3. It can only be visited by appointment. 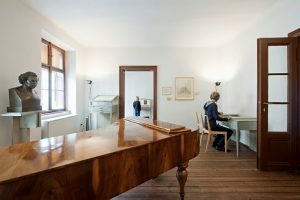 Or you can meet Schubert 30 years later in his last apartment, consisting of 2 rooms and a cabinet in which he lived as a guest of his brother until his death in 1828. Composer Joseph Haydn spent his last 12 years at his house in the suburbs. There he wrote “The Creation” (“Die Schöpfung”) and “The Seasons” (“Die Jahreszeiten”) and died in 1809 at the age of 77. In addition to the apartment, you can also visit the garden, which was redesigned around 1800.